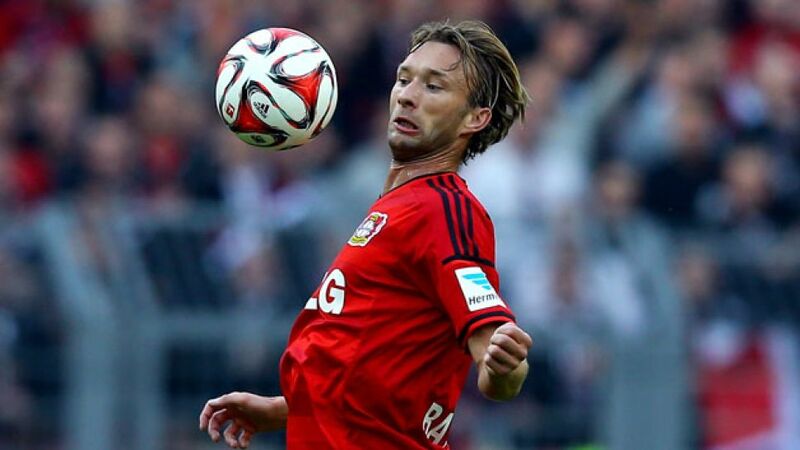 Cologne - After a long and distinguished career, predominantly with Bayer 04 Leverkusen, Simon Rolfes is hanging up his boots at the end of the season. The 33-year-old midfielder made his decision known in December and he has confirmed it more than once since - of necessity, given his own excellent recent form and that of the Werkself as a whole. “Couldn't you maybe try and persuade Simon to stay on? I haven't had any luck so far,” the club's managing director Michael Schade jokingly responded to a journalist's query as to whether Rolfes might yet reverse his decision. The former Germany international's mind, though, is evidently made up, and he is nearing the end of his farewell tour of the country's Bundesliga stadiums. “I'm savouring every game. Success makes for a good time, and if I can play my part in it, all the better,” the outgoing skipper reflected. With Bayer having been knocked out of the UEFA Champions League by Club Atletico de Madrid on penalties, and exiting the DFB Cup in the same fashion , Rolfes has one remaining goal this season: a top-three finish in the Bundesliga, and the accompanying automatic berth in the group stages of Europe's premier club competition again next season. “We have to be targeting third place and trying to keep the pressure on Gladbach,” he said. His own part in that project has thus far added up to 18 games, only two of which Bayer have lost. And after a bit of a mid-season malaise, the recent form curve is certainly on an upward trajectory. Significantly, Roger Schmidt's charges bounced back from each of those penalty shootout disappointments with a resounding victory. The 1-0 Matchday 26 win at direct rivals FC Schalke 04 made particularly evident how Leverkusen, who pushed persistently high up the pitch with almost wild abandon during the first half of the season, have now found a much better balance between attack and defence. And Rolfes has had a key role in that process. “There's a lot more structure to our pressing now, allowing us to keep things tight at the back. And we're playing more economically as well,” he explained. The upshot is six wins on the trot, taking them to within one of the club's single-season record, which they can equal against struggling Hannover 96 this weekend. At any rate, fourth place and a Champions League qualifying tilt already looks fairly secure, with a ten-point cushion on Schalke below them. Looking in the other direction, Matchday 32 promises to serve up the real clincher, when Bayer travel to Gladbach, currently two points ahead and in similarly outstanding form. Rolfes aims to make his last working trip to the Borussia Park a productive one, so he can savour the Champions League experience with Leverkusen once more next season - this time, in the voluntary role of spectator.